This is something I advocated for as a constituent and now as a Representative. It outlines the duties and responsibilities for both landlords and tenants regarding notice, inspection, and treatment of an infestation. Directs landlords to retain a third-party inspector or inspect the unit themselves if tenants report that they know or suspect their unit is infested with bed bugs. Requires landlords to hire and pay a pest control agent to treat bed bug infestations if they are unable to successfully treat the infestation themselves. Requires a landlord, if he/she treats the infestation him or herself, to have a third-party inspector confirm the treatment's success. Makes tenants financially responsible for subsequent treatment costs for their unit and contiguous units if they knowingly and unreasonably fail to comply with treatment measures. 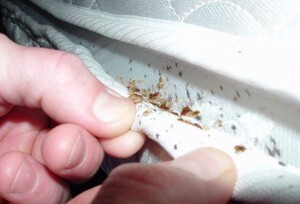 Prohibits landlords from renting units that they know or suspect are infested with bed bugs.